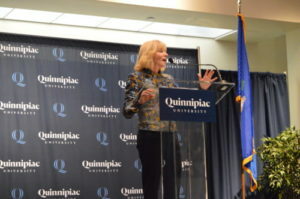 Quinnipiac President Judy Olian plans to announce a new strategic plan in January that will result in significant changes to Quinnipiac’s staff, students and status quo. While the full plan remains under wraps, the plan is expected to include a new academic facility and more full-time faculty. The strategic plan, under direction of President Olian and Provost Mark Thompson, consists of different work groups focusing on specific areas of action such as facilities, budget and technology. Additionally, Olian and Thompson asked the dean of each academic school to submit a list of priorities to be included in the plan. According to Robert Smart, dean of the College of Arts and Sciences, the plan is something Quinnipiac has needed for a long time. While President Olian will be releasing the university-wide plan in January, Smart expects to hear from the College of Arts and Sciences in November. Seán Duffy, executive director of the Albert Schweitzer Institute and professor of political science, believes the plan is going to create drastic changes here at Quinnipiac. “What we’re engaged in is a very visible and open process to begin creating a long term plan that would include things like space, size of faculty, priorities, those kinds of things that are based on strategic thinking,” Duffy said. Lisa Burns, chair of the media studies department, was the chair of the Faculty Senate last year. She presented to the Board of Trustees in May 2018, and talked about the faculty’s hopes for the strategic plan that they helped to initiate. Burns outlined several key staff priorities for the strategic plan, which she said Mark Thompson asked the Senate Finance & Future Plans Committee to help brainstorm. The resulting list of priorities, according to Burns, does not include “anything surprising,” but rather is just a logical fix to the problems Quinnipiac is already facing. Burns listed more full-time faculty as her top priority in May. Months later in October, she still believes Quinnipiac is facing a faculty shortage emergency. For example, the College of Arts and Sciences has lost 12 full-time faculty since the spring of 2015, but the student population in the college has increased by 1,659 students, according to Dean Smart. “We don’t have enough faculty, full-time faculty, so we rely on a very large number of part-time faculty,” Burns said. In her report, Burns said that Quinnipiac is “too reliant” on part-time faculty and a high percentage of the University Curriculum (UC) is taught by part-time faculty. The UC, which comprises one-third of a student’s course-load, is taught by 79 percent part-time faculty, according to the May 2018 Faculty Senate report. Even if Quinnipiac were to hire more full-time faculty, Burns believes Quinnipiac does not have the office or classroom space to house them. Burns explained that the faculty and facilities crisis facing Quinnipiac detriments the high-quality experience that Quinnipiac prides itself on. The problems have forced departments across campus to offer late-night classes, less personalized advising and classes taught by part-time high school teachers. Burns noted that the struggles students experience during registration are a direct result of not having enough resources for Quinnipiac’s student population. The other priority Burns listed in her May report is facilities that are “as nice on the inside as the buildings are on the outside.” Burns expressed discontent with the quality of the facilities in many of Quinnipiac’s buildings, particularly Tator Hall. “Tator Hall is awful, it’s basically a cinderblock building that is probably worse than most people’s high schools that they went to, so it’s embarrassing to teach in Tator Hall,” Burns said. Finally, Burns requested a budgeting process that allows academic units to be involved in the decision making process. Whether the president’s final plan will include a new building or more faculty will be unclear until January, but Quinnipiac faculty, including Duffy, feel the plan is a promising and necessary fix to a serious problem. The article previously stated “The UC, which comprises one-third of a student’s course-load, is taught by 79 percent part-time faculty, according to the May 2014 Faculty Senate report.” and has been corrected to the proper year of May 2018.